Fencing is a way of life. It’s a path to explore what it means to be human and to be alive. 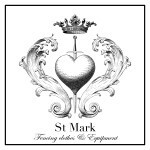 St Mark is a company dedicated to Historical European Martial Arts–HEMA– and those in pursuit of the Art of Fencing. Fencing history is full of people who have stood up for ideals, honour and love. The inheritance and stewardship of these traditions is important for any fencer who wishes to follow in the footsteps of the ancient masters. Axel Pettersson is probably one of the most famous practitioners of HEMA today. He has won more international tournaments than anyone else, and he also travels the world to teach and hold workshops. He has trained and coached a long range of successful competitive fencers. Anders Linnard is the founder of Gothenburg Historical Fencing School, he has a great competitive track record, and is the first Swedish National Longsword Champion. He is well-known for his interpretations, pedagogical methods, and for his philosophies on fencing and visions for traning. Don’t forget to like our Facebook page and subscribe to our Youtube channel. We also have a sister site called The Historical Fencer.